Visiting Russia is full of challenges, not least the weather. Winter stays around a long time, and it's not appealing for travelers. If you plan on ignoring that weather constraint in favor of likely cheaper flights and accommodations, you can expect temperatures to be cold but not unbearable in Moscow in March. The weather in Moscow tends to fluctuate in March, with the beginning of the month being much colder then the temperatures rising as the days go on. More good news: The length of the day increases by more than two hours from the beginning of March to the end. But there is some bad news: It will be cloudy most of the time and the chances of precipitation (probably snow) are high. Both of these situations improve as the month goes on. Suffice it to say, the weather in Moscow in March is a negative aspect. The flip side is that you will have the tourist attractions mostly to yourself and likely will pay less for flights and accommodations in this low tourist season. Big bonus: Moscow's landmarks look sparkling in the snow. 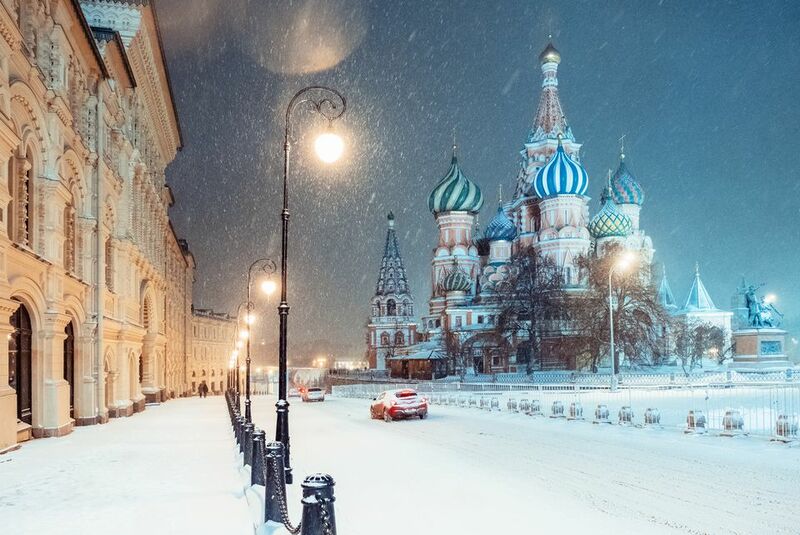 Pack for winter weather when you travel to Moscow in March, regardless of when in the month you plan to be there. In particularly cold years, snow might still be on the ground or it might arrive while you are there and hang around for a while, perhaps your entire stay. Include all your cold-weather accessories in your luggage—a warm scarf, gloves, and hat—so you'll have them if you need them, which is pretty much of a certainty. It might be fun to buy a fur hat in Moscow, where the selection is no doubt terrific. So leave room in your bag if you're thinking of that as an apt souvenir. Take along heavy-weight jeans, pullover sweaters in lightweight and packable but warm cashmere, vests, and a warm winter coat. If you have one with a hood, that would be a smart choice. If you plan to do a lot of walking, you'll also want warm socks and shoes that will keep your feet warm. Flat knee-high boots or flat ankle boots with rubber or composition soles (not leather) are the shoes of choice. Then no matter how much it snows, you'll be ready for non-slip walking. There are many holidays and activities to enjoy when visiting Moscow in March. Plan ahead so you don't miss out. Maslenitsa: Also known as Butter Week, Crepe week, or Cheesefare Week, Maslenitsa is an Eastern Slavic religious and folk holiday that usually falls the last week before Lent. Head to Red Square to take part in this hugely popular farewell-to-winter festival. International Women's Day: In Russia, International Women's Day is held every year on March 8. To celebrate, the city and main square are decorated with colorful bouquets of flowers and greeting cards for women. St. Patrick's Day: St. Patty's Day is celebrated the week of March 17 in Russia. Check ahead for scheduled events related to this fun-filled Irish holiday, which is a big deal in Russia where on this one day, everyone wears green. Russian Fashion Week: Designers, celebrities, and fashion icons gather every year in Moscow for the spring fashion week. In 2019, it will be held from March 30 to April 3. March may not be as brutal as the dead of winter in Russia, but it is still extremely cold. Check the weather ahead of time and stay safe and warm by packing the appropriate clothing. However, March is one of the most affordable months to visit as it's during the spring shoulder season and not many travelers can brave the cold. You're likely to find lower hotel rates and good airfare deals. There are plenty of indoor activities to take advantage of in March, such as museums, art galleries, elegant restaurants, and live music venues.